GH Armor Systems LiteX Level 3A Concealable Custom Body Armor FREE SHIPPING! 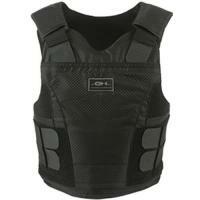 GH Armor Systems' LiteX Level IIIA body armor packs top-of-the-line performance into a comfortable, concealable package. Its hybrid design incorporates Twaron, Goldflex, Kevlar XP and XLT, exceeding the toughest benchmarks of shot placement, angle and quantity. It is also special-threat tested against the common 9mm 127gr SXT and .357 Sig 125gr GDHP for reliable performance. For wearers in need of additional protection, front and rear trauma plate pockets offer an extra layer of defense. The structured female style comes with 5" x 8" pockets, while the male style can also have an 8" x 10" option. Despite its formidable resistance to impact, the armor's low profile allows it to fit neatly and comfortably under clothing. The moisture-wicking, stain-resistant inner mesh prevents it from getting uncomfortably sweaty, and its antibacterial coating also stops odors from building up. The removable four and six point strap kit provides customizable and versatile mounting options for accessories. Note: This is a custom-made product. Allow six to eight weeks for delivery. ©2002-2019 CopsPlus.com: GH Armor Systems LiteX Level 3A Concealable Custom Body Armor FREE SHIPPING!